There is a new coffee bar in the centre of Antwerp called Glow, which stands for Generosity, love, openness and wisdom. The coffee bar is run by a lovely couple that moved to Antwerp to live their dream of owning their own coffee shop. Of course Sarah and I had to go and see what it was all about! On the menu you can find breakfast, different types of sandwiches and of course some sweet homemade treats. I had one of their chocolate chip cookies and a latte star, which had whipped cream, oreo-crumble and caramal in it. The coffee was absolutely delicious and it looked very tasty as well so I definitely recommend trying that one! The service was incredible! The lady who owns the place was very chatty and was more than happy to tell Sarah and I how Glow came about. She makes every customer feel right at home! If I had a coffee bar, I would decorate it exactly the way glow did. It looks so spacious and light but they still added some personal touches. Her sister handwrote the menu and there are little frames on the wall that say generosity, love, openness and wisdom. A fun fact is that the staircase is actually from the 19th century. Make sure to pay a visit to this coffee bar for a nice chat and a cup of delicious coffee! A while ago Sarah and I went to this lovely restaurant called Bia Mara to put it to the test. This fish and chips restaurant serves the classic British dish with a twist: instead of using the old cod they like to use as many different types of fresh fish as possible. Bia Mara also tries to as sustainable and eco-friendly as possible. Since this was a fish and chips restaurant, I obviously had to try them (they do have other dishes) so I went for the classic panko with Seaweed Salted Chips and Homemade Tartar Sauce. Let me tell you, I’ve never actually had fish and chips but this dish was absolutely delicious! Everything was cooked perfectly and it all went really well together. I also tried one of their homemade lemonades which tasted really good so I would definitely recommend trying one! Sarah tried one of their vegetarian dishes so go and have a look at what she though of it on her blog! The service was really good as well; when I asked one of the waitresses about the concept she kindly explained everything to me and she was happy to help us pick what to eat. The interior might have been one of my favourite things about this restaurant. I loved the fact that it looked very plain and simple but they added nice touches to it. The copper lights might have had a slight impact on my opinion though. Overall Sarah and I really really loved this place and we are definitely going back to have some more delicious food! If you want to go try some fish and chips yourself (which you totally should), you can have a look at their website or facebook page. Christmas is approaching and that means there are some very lovely christmassy bath products in store. Lush always brings out the best bath bombs around this time of year but sadly enough I don’t have a bath. They do however have a few festive products that you can use in the shower. The first one is the Santa’s belly shower jelly which is a shower gel that has a jelly consistency. They have a lot of different shower jellies like snowman, refresher and whoosh. This particular one is red and has a some glittery stars inside of it. It contains different ingredients, one of them being apple juice which makes it smell really wintry! The second product is the magic of Christmas Fun which definitely does its name justice. This multi-functional product can be used to wash your hair and your body but it is also a kind of plasticine that you can play with. Fun is a perfect excuse to feel like a child again! The magic of Christmas version has different ingredients in it that are all great for your skin like ylang ylang, tangerine and juniper berry oil. If you do have a bath, there are tons of different bath bombs that you could try. So if you are interested in them or anything mentioned on here go over to lush to have a look at the products! Discovering new stores can go two ways: you either stay in there for hours or you’re gone within the first five minutes. Juttu, a store on the Meir in Antwerp, is one of those places where you can wander around and completely lose track of time. The minimalist façade and the exotic name of the store immediately caught my eye. Juttu is actually Finnish for story or anecdote. The concept behind the store is that every brand they sell has its own unique story. One of them called Le Monde en Tube sells herbs in a tube that come straight from a French woman’s garden. Juttu sells everything from clothing to food to homeware, all of it divided into different corners and organized per style. They have an origin corner, which is worldly and authentic, but they also have a majestic corner, which is more clean and chique. To top everything off they have a food corner where you can take a break from shopping and have a drink. The store has a pop-up space as well where they put up-and-coming talent in the spotlight every month. This month they chose Maurice Knitwear: a label that has two coffeebars and a hand-knitted clothing- and accessory line. They sell very fashionable and cosy cardigans that are perfect for autumn or winter so make sure to check that out! Definitely go and pay a visit to this lovely store for a unique shopping experience. My lovely friend Sarah and I have come up with a new concept called Duo Taste test where we review restaurants together. The first place we went to is a cupcake shop called Momade cupcakes. I tried two of their cupcakes: an oreo-cookie one and a chocolate-raspberry one. The oreo-cookie cupcake had a delicious oreo cream cheese frosting and it tasted very sweet. The chocolate-raspberry cupcake had an actual raspberry on there which was a real plus! It was my favourite out of the two because I am obsessed with chocolate. The girl who worked there was really kind! She was kind enough to explain what was in the different cupcakes which was very nice. The shop looked really nice because the walls were all white and there was a marble counter. It looked really crisp and clean! Definitely go try one of their many cupcakes because they are amazing! Go have a look at Sarah’s review too to see the cupcakes she tried. 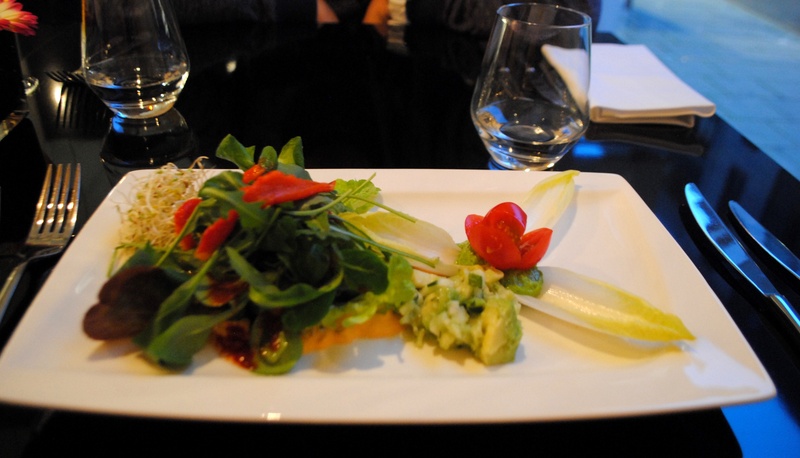 TAN is a restaurant that serves very pure, natural and clean dishes. Most of the things on their menu are raw or they are cooked at very low temperatures to preserve as much nutritional value as possible. It also has a store where you can buy organic food which is really nice because you can pick some things up after your dinner. The first thing I had was a raw salad. Now you might think that it’s just like any other salad but it’s not. Everything tastes very pure and the way they use different textures makes it taste a lot more interesting. 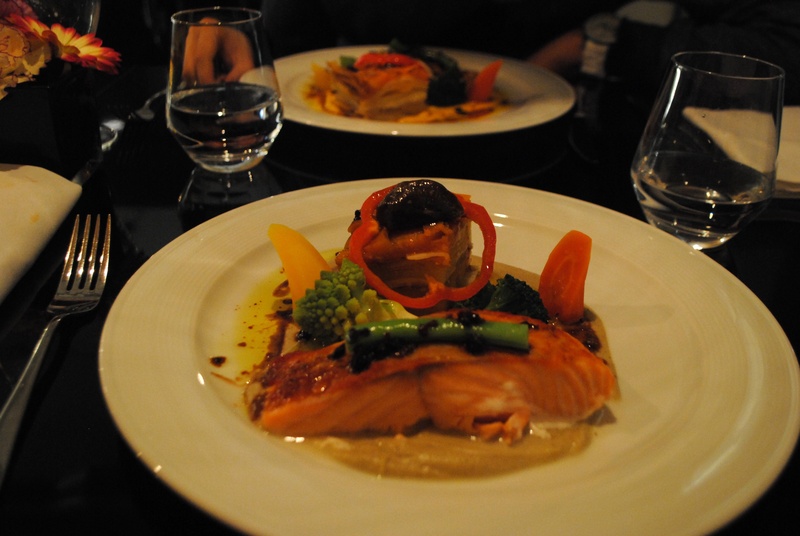 The main dish was salmon filet with vegetables and an aubergine cream. As a salmon lover (yes that’s a real thing) I absolutely loved this dish. The fish was cooked perfectly and the vegetables still had a nice crunch to them which was quite nice! The aubergine cream isn’t something I would normally eat but it went really well with the rest of the dish. After the main dish one of the waiters came to us to ask if we wanted to have some dessert. He explained that it isn’t on the menu because they don’t believe in having dessert and he gave us a very good explanation of their “food philosophy”. 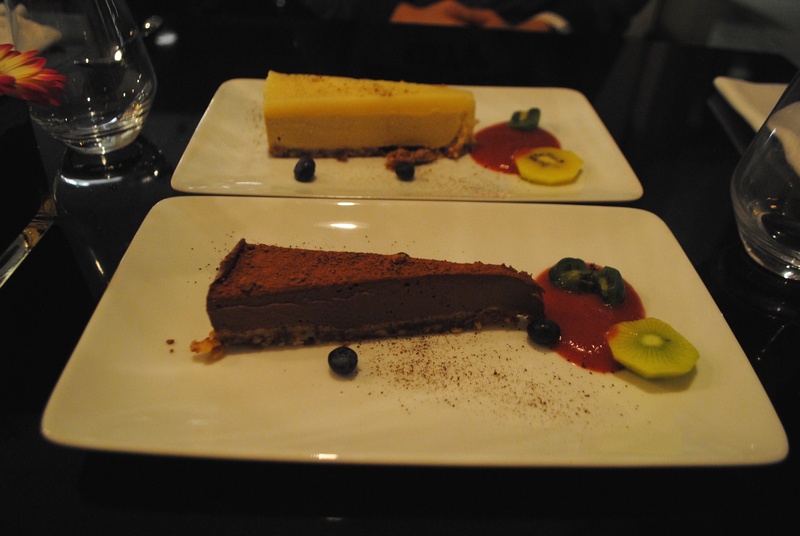 (read more here) When he told me what the dessert options were though I knew I had to try them out. So I ended up having some raw chocolate cake and it was delicious! It tasted fruity but chocolaty at the same time and I just loved it. I also loved the fact that I was eating chocolate cake yet I knew it wasn’t anything unhealthy. This restaurant is a must visit not only because of their amazing food but also because it is such a unique experience. You will be amazed by how different everything tastes. The service was also really great and they are happy to answer any of the questions you might have! So go and check this place out! A good thing to do during autumn is go for a walk in a park. It’s relaxing, you get some fresh air and you can take some beautiful pictures. Walks aren’t for everyone though because let’s face it, they can be quite boring. This park is a different story though; it is a museum and a park in one. Both aren’t actually my favourite places to visit but I would definitely recommend visiting the Middelheim Park ! There are about 200 statues from different eras on display which makes walking around a lot more interesting. And after your stroll around the museum you can go to a café called Mika where you can treat yourself to a nice hot chocolate or a delicious sandwich. Autumn is upon us and I could not be more excited! The colourful leaves, the cosy sweaters and the candles make this such a lovely season. Now, it has been a while since I have done a fashion post so I thought I would do one for this season to inspire you! This is the last season you can wear skirts and dresses without freezing to death which is why I chose to wear a skirt with a long sleeve crop top and an oversized coat. This outfit is not too warm and not too cold so it’s perfect for autumn! My absolute favourite city in the world is London. I love every aspect of it: the language, the shops, the food and even the public transport. So that being said, I have a fabulous guide to the lovely city of London for you. Soho (pic. 3): If you want to eat lots but don’t want to spend too much money China Town in Soho is the place to be. There’s an array of all you can eat buffets to choose from and most of them are about 6 to 10 £ per person. One of my personal favourites is Mr Wu on Wardour street. Camden market (pic. 4&5): Hipster alert! Camden market is the coziest place ever!It’s a market with lots of different food stables that offer something for everyone. 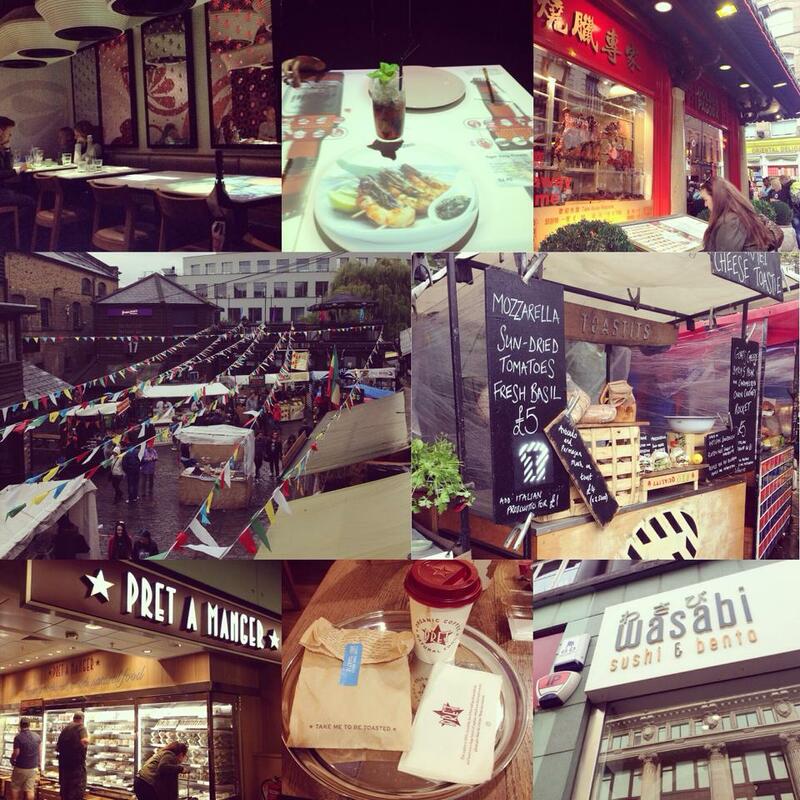 Whether you’re looking for Asian food, gluten free food or vegan food; Camden market will have it. Pret a manger (pic. 6&7): Pret is perfect for you if you’re into organic food. They serve so many different things like sushi, sandwiches, soups,etc. A huge plus about this restaurant as well is that you can literally find it on every corner of the street. Wasabi: For all the sushi lovers out there, I have Wasabi. This restaurant serves individually wrapped pieces of sushi at an affordable price so you can try different ones! They also have soups, salads and more. Definitely a must visit when you’re in London. Camden market: Not only does this market have great food, it also has the cutest shops. What I like the most about Camden Market, believe it or not, is the fact that it has a vintage photobooth! I like taking a picture in a photobooth when I go on holiday so if you want one too, Camden is the place to be! The Royal National: If you’re looking for a decent hotel, this will be your cup of tea. The Royal National hotel is located in central London and has a tube station within walking distance. They have a very nice breakfast buffet and the rooms are simple but clean. YHA oxford street: People on a tighter budget will love this Youth Hostel! Oxford Street is around the corner and trendy Soho is within walking distance. The bedrooms as well as the bathrooms are small but tidy. The staff is very kind and shows a lot of interest in their guests. Definitely go check this out! 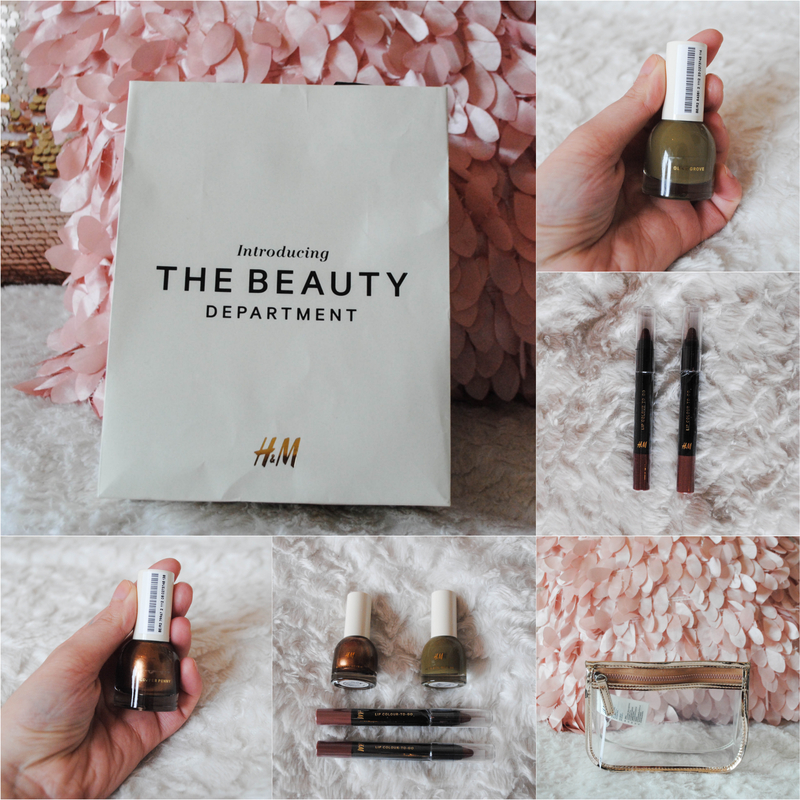 H&M recently launched their new beauty department in Belgium and it is honestly beauty heaven! Like the shopaholic and beauty lover that I am, I had to go and see what it was all about. I had very low expectations of their beauty department because they already sold beauty products so I assumed that it would just be along the lines of their other products. I couldn’t have been more wrong though. Their new range offers things that I had never even heard of before. What stood out the most for me were their hair products. They even have a BB cream for your hair, how cool is that? The nail polishes that I bought are copper penny and olive grove. They are very easy to apply since the brush has the perfect size and I only needed one coat which is a big plus. One nail polish costs 4,99€ which is not very expensive as they are of very good quality. Furthermore, I bought two lip pencils in the shades rendezvous and chocs away which turned out to be a matte one. They are both very pretty and easy to apply although the matte lip pencil tends to make my lips a bit dry. Overall their new beauty range has exceeded my expectations and I am very pleased with my new products. If you would like to check it out yourself you can go to http://www2.hm.com or you can pay a visit to your local h&m (not every h&m has a beauty department though).